Both sexes: Metallic blue upperparts and tail streamers, cream belly and russet throat. Swallows have long wings and long tail streamers and are often found circling gracefully overhead or swooping low over water and ground. The sexes are very similar, having metallic royal blue upperparts and breast band, cream-buff underparts and russet (red-brown) forehead, chin and throat. 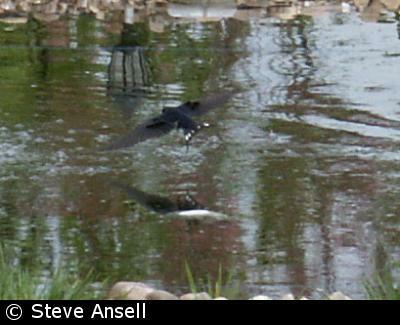 The tail has white markings along the inside edges of the fork. The bill and legs are black. The female's tail streamers are shorter than those of the male. Juveniles are duller, lack both the russet forehead, chin and throat and the tail streamers are much shorter. 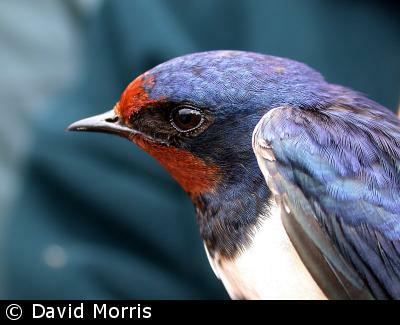 Swallows herald the arrival of spring as they arrive back in Britain after wintering in southern Africa (see migration). As the time to return to Africa approaches they become restless and can often be seen perching in large flocks. Their song is a rambling warble of trills and twitters sometimes sounding almost like a sparrow. 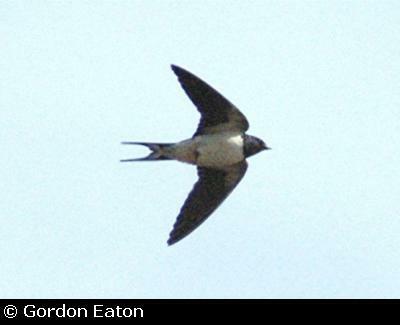 Swallows, like other hirundines and Swifts, feed on the wing by catching insects in their large gapes. 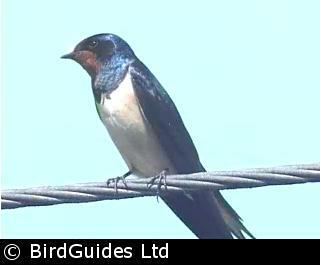 The long tail feathers give Swallows exceptional manoeuvrability, better than House Martins and Swifts. 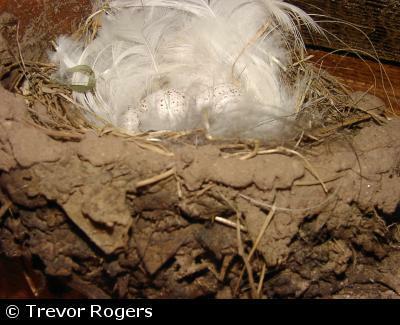 Both adults build a nest from mud and plant fibres against a beam or shelf in buildings or a ledge on cliffs. Existing nests are often refurbished, and there are instances were nests have been reused for nearly 50 years. The eggs of the Swallow are about 20 mm by 14 mm in size, and are smooth, glossy, and white with reddish speckles. The duties of incubating the eggs are performed by the female. The newly-hatched young are fed by both adults, who catch insects on-the-wing and collect them in their throats before returning to the nest. Once fledged, the youngsters receive in-flight food from their parents. 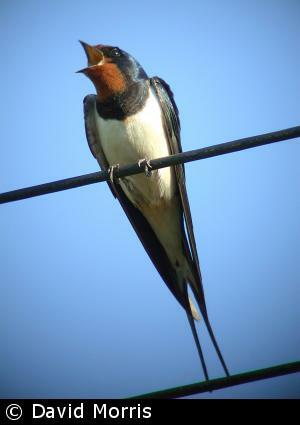 Swallows are summer visitors, arriving from late March to mid-May and returning to their southern African wintering grounds in September and October. A few individual birds winter in southern England and Ireland. Climate change in their wintering grounds, along their migration routes and in their breeding areas. The ever-expanding Sahara is becoming an increasingly hazardous region for the birds to cross. Reduced numbers of nest sites and insects owing to changes in farming practices.